So I downloaded the game, died a few times, yelled some, and eventually beat it. Once you have the skills, the game is a short experience akin to sight seeing through the back alleys of a somewhat unknown and equally indie music album. Everyday Shooter is not a game for zoning out, though. Sit up and fight vector enemies with vector bullets. This isn't a passive experience. React to the game and it will react back. Pay attention to the forms, figure out the unique chaining system per level, and abstract meaning from the somewhat abstract images on your own time. It was obvious from first playing Everyday Shooter that the control scheme had been originally designed for the PC, or at least not with the PS3 controller in mind. Movement is controlled with the left stick with no problems with the correlation between the on screen action and the controller feel. However, the aiming/shooting isn't designed to take advantage of the analog controls of the PS3's right stick at all. Instead, the player can shoot in four directions using the four "shapely" Playstation buttons. After moving between two aiming buttons, the stream of bullets sort of lazily adjusts to the change in direction. These mechanics automatically shape the gameplay in a number of ways. Aiming, which includes shooting and positioning of the player, becomes some what quantified. It's easiest to hit targets that are exactly up, down, left, and right of the player. It's less easy to hit targets diagonally due to the slow auto-adjusting feature in the aiming mechanic. Accurately hitting targets in between these any of these 8 directions is very difficulty and becomes more so the farther away the target is. To correct for the aiming disability, I often positioned the player avatar at a cardinal direction to my target. In this way, the aiming system deconstructs the analog player movement abilities and the level design. 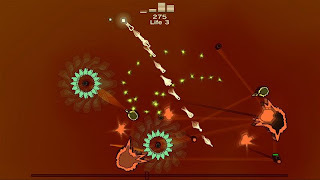 Everyday Shooter's levels are designed with enemies that come in all shapes and sizes, floating around and maneuvering in fluid curves and trajectories. The player's smooth analog movement and precise hit box adds to this sort of fluid mosaic model. Controlling what is practically a dot on the screen, players are free to move about the liquid level design, switching places and dodging in between tiny cracks in the momentary layouts. Unfortunately, because the aiming system tends to lock the player into shooting in the 4 comfort cardinal zones, the fluid design and how it influences fluid character movement is partially wedged into a ridged, grid like execution. To shoot effectively, I often have to "snap" into a grid like world where my targets were always on some vertical/horizontal orientation to my player avatar. This issue is easy to solve. Geometry Wars and Super Stardust HD are both twin stick shooters that are good examples of smooth, intuitive aiming controls. Assuming Yesterday's Shooter would release on the PSN, upgrading the aiming controls to take advantage of the PS3 dual analog sticks would be the easiest repair. Because the primary mechanic of Everyday Shooter is SHOOT, there are a few potential design pit falls that must be addressed: interplay/gunplay and static space. What's most interesting about these two issues is, they're somewhat correlated. More on that later. In Everyday Shooter, the vast majority of elements in a given level is can be shot and subsequently destroyed. 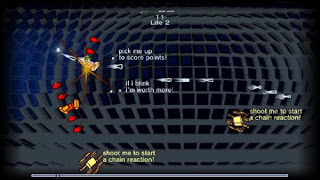 The player has infinite ammunition, which makes taking down even a large target as simple as aiming and holding the fire button. Geometry Wars has a similar set up. But where Geometry Wars floods the screen with weak enemies that hunt the player, Everyday Shooter's levels have fewer enemies with health bars making them able to sustain multiple hits. In Everyday Shooter, most enemies don't take stun or knock back from being shot, and they carry on in their normal fashion until they're destroyed. Because of these design features, Everyday Shooter generates some static space when destroying a single target. As the player keeps SHOOTing, the enemy keeps doing what it does oblivious of its imminent death. The fact that much of the game state remains unchanged while an enemy's health is being drained creates the static space. Because the player can die from a single hit, the enemy at 100% health is just as deadly as when it's at 1% health. In this way, a lot of the flow of the game is stagnated by these small periods of static space. Until the enemy is completely destroyed, the work the player puts into the game doesn't change the game. Gunplay, interplay with projectiles, is difficult to create due to the nature of projectiles. It doesn't help that Everyday Shooter only has two independent (primary and secondary combined) mechanics to work with. Because the player dies in one hit, you're either alive or dead. Enemy attacks are either hit or miss. And it's a similar design situation with the SHOOT mechanic; ie. player shots will either hit or miss. Because the enemies generally don't take stun or get knocked around by the player's attacks, on the basic level Everyday Shooter doesn't feature a lot of gunplay. The majority of the basic interaction of the gameplay consists of simple move and shoot maneuvers: ie, move out of the way of danger/into position and shoot until target is destroyed. The MOVE mechanic is straight forward. The only issue I have with this mechanic is that the player's movement speed slows down when firing. I can see how Mak wanted to give the core mechanics a bit of variety and strategy when players balance maneuverability (defense) and firepower (offense). But, I think the reason this feature falls short of its goal is because neither the SHOOT or MOVE mechanic are interesting/engaging enough individually before. In other words, the only thing to do when moving is move out of the way of danger and position oneself for attack. Likewise, the only thing to do shooting wise is to shoot in the direction of the target. When shooting reduces the player's movement speed, the strategies remain the same yet they're, at times, slower to execute, which can bore or frustrate the player. Here is where things get interesting. Each level in Everyday Shooter features a different chaining system. Using the system, players can destroy enemies significantly more effectively than by simply using the basic approach of "destroy the enemies one at a time." What's most interesting about Everyday Shooter's chaining system is that it exists in tertiary mechanics. In other words, instead of chaining being the result of mechanics/elements the player directly controls (not getting hit [Ninja Gaiden/DMC] , killing all enemies, destroying multiple targets with one shot [Star Fox 64/Rez], destroying X numbers of a single kind of enemy in a row [Space Invader Extreme, Ikaruga], hitting multiple enemies without touching the ground [2D Mario platformers, Donkey Kong Jungle Beat]) the elements that activate chains in Everyday Shooter are enemy/level elements. Because enemies are randomly arranged/spawned into each level, players have to look sharp and work improvisationally. Unfortunately, all the chaining systems except the first few levels, are shrouded in abstract mysteries. It's nice to have to figure things out for yourself especially in a game this short, but the only way that's possible while being efficient is if the game's forms and mechanics instruct the player. If I can't tell what the chaining system is for a level by how it looks and plays, then it's practically a secret requiring a lot of trial and error to figure out. Ultimately, Everyday Shooter is not a puzzle game where figuring out the level is the main focus of the gameplay. 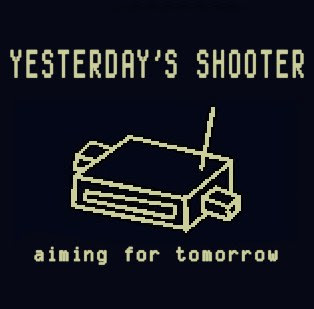 I find playing Everyday Shooter far more interesting than guessing and checking my theories on the chaining systems. At least the game lets players select individual unlocked levels so they can experiment without worrying about losing everything. SHOOTing should not slow down MOVEing. There are better ways to create an interesting interrelationship between player mechanics. Besides fixing the reduced moving speed when shooting, there is one mechanic that, when added to the existing set of mechanics, would create a well-rounded core deisgn. That mechanic is CHARGE. As I've explained in this article, the CHARGE mechanic can reduce the spam and static space in a shooter especially one with infinite ammo. Just like in MegaManX, the charge attack in Yesterday's Shooter should be larger than the standard shots, travel faster, do more damage, and give enemies more stun and/or knock back. Additionally, charging an attack should gradually slow down the player as the charge builds in strength. In this way, there is a strategic balance within the trade off of maneuverability and power that comes from a well-rounded set of core mechanics. With the fixed aiming controls, moving quickly and accurately shooting rapid shots strategically contrasts the reduced movement speed and added strength/ability that come with the CHARGE shot. However, these changes aren't enough to individualize each core mechanic. To individualize the MOVE mechanic, there should be some level elements or parts of enemy elements that don't hurt the player when touched. By moving against these elements, the player would be able to add an additional functional layer to the MOVE mechanic: PUSH. By PUSHing enemies/level elements, the player can interact with the game world in a new, engaging, and non lethal way, which will accentuate the specific function of the SHOOT and CHARGE mechanics. In other words, when everything in the game isn't trying to kill the player and won't kill the player when touched, the world becomes more fully defined through the contrasting functions of its elements. To put a cap on these core mechanics, a few limiting factors should be added. To MOVE/PUSH level elements, players simply move the character against a moveable element. However, this works best when not SHOOTing and especially when not CHARGEing. Think of this feature as if the player has a limited amount of energy to invest in any one mechanic. Also, when a charged shot is released, the player should recoil back in the opposite direction of the blast. This recoil feature should also function like a powerful short ranged PUSH. With these nuances to the core mechanics, the mechanics effectively feed into one another, individualizing and supporting each others' functions. Using vector graphics naturally creates a very stylized, clean look. However, shortly after the start of each level, Everyday Shooter becomes very cluttered. One of the challenges Mak faced when converting ES to run on the PS3 was adjusting each level from a standard aspect ratio to widescreen. I don't know if Mak adjusted the number of enemies on the screen to help fill up the additional space, but there is certainly too much going on in the game. The player is functionally a dot in the middle of a widescreen ocean. There is only so much the player can interact with at one time even with an unlimited long range SHOOT mechanic at his/her disposal. There is definitely a sense of hopelessness that comes from watching the game float away and pass you by. At times there's more "game" listlessly floating past the player than what's being played. This feeling only increases as the player struggles to interact/fight using the primary mechanic because player movement slows down when shooting. Another layer of clutter comes from points that drop from destroyed enemies. The IGN review of Everyday Shooter by Ryan Clements puts it well. More problematic, instead, is the aforementioned point gathering, which is extremely flawed. The little pixel points (which look very much like your ship), disappear after a very short time. Since you don't move very quickly, you'll oftentimes create a huge chain explosion, only to find that the field of beautiful and delicious pixilated goodness cannot be consumed quickly enough, fading away into oblivion. Poor pixels. This wouldn't have been too concerning had the points been easy to collect, but they're unfortunately not. Actually flying over all the points is far less effective than it should be, since zipping through a huge clump of them will often yield only a few actual pick-ups (despite the fact that your ship can pull at the points as you go). Again, this problem certainly doesn't ruin the gameplay - not at all - but it can be a noticeable frustration. It's clear that the points in Everyday Shooter don't follow the Super Mario Brothers Coin design. It can be very frustrating after chaining the destruction of many enemies revealing a Milky Way of points as a reward to have those points quickly disappear as if they were only placed in the game to taunt you. Somewhere in the balance between displaying lots of points, the small field of attraction they have to the player, the player's slow movement speed that reduces when firing, yields results with more visual noise than positive reinforcement. The last example of visual clutter comes from the death animations, explosion effects, and the lively background. Some enemies when destroyed burst in a large flashy explosion. The game is crowded enough without these visual outbursts, which can easily distract the eye. When the player is just a small colored square in this ocean of vector visuals, it can be far too easy to lose track of where you are on the screen. Because the screen stays fixed and zoomed out, the player can't simply trust that the camera will always position them in the center of the screen. Normally in games like Everyday Shooter, players use their infinite bullets as a beacon to locate their position. Unfortunately, when situations get tight in ES, shooting such a beacon will slow down player movement, which can lead into a quick death. If the enemies are redesigned and tweaked so that they are designed to fully interact with the player's new set of mechanics, then an individual enemy will carry far more weight and attention than before. The new mechanics open up Everyday Shooter to design enemies with a lot of interplay and dynamic interactions including interruptions, stun, and knock back. In essence, this design move is like turning a Geometry Wars enemy (a straight forward, dispensable, one trick pony), into a Goomba or even a ParaTroopa. When each enemy is more interactive and significant, there won't be the need to put so many of them on the screen at once. This move would instantly reduce the level of visual clutter in the game. The simple solutions for fixing points are obvious. Make them last on the field longer and/or make them attract to the player better. However, there are more interesting ways to modify the point design that can at the same time encourage the player to play more in the spirit of the game and even take some risks using organic difficulty methods. After all, the point system in ES is functionally similar to coins in Super Mario Brothers. In both games, collecting enough coins affords an 1up/extra life for the player. The entire screen is available for the player to shoot bullets into. Such is the nature of projectiles/guns. Clever games create situations and strategies that encourage varying styles of combat at long, mid, and close range. In Halo, each weapon has a range of effectiveness creating dynamic layered strategies. Along with the ranged gun weapons, thrown grenades increase in hang time the farther the target is from the player, and melee attacks (including the 1-hit KO assassinations) can only be done at close range. So, to solve the point problem in Everyday Shooter, new features can be added to encourage and reward the player for close range combat for example. The points can have a really strong attraction to the player if the enemy is destroyed at close range.This design will encourage players to strategize the timing of their attacks while playing at different ranges. Also, holding the charge could increase the range that points attract to the player. Such a feature would be balanced by the reduced movement of a charging player. Finally, the look of the enemies, death animations, and backgrounds can be designed to achieve an exact functional purpose in addition to being visually entertaining. If form fits function is the door to better design, even when the visuals are vector shapes, then color coding is the key. With the repaired Everyday Shooter core design, there is more specific information to be communicated to the player. By color coding the various game elements "safe to touch" elements, PUSH-able, and elements that react uniquely to CHARGE shots can all become clear. Mak already started the idea by color coding the points to be the same color as the player avatar. Such a little touch goes a long way when the player is on the run and has to make a split second decision on how to maneuver. By further developing this idea, the clarity can only go up while the frustration and reckless experimentation goes down. Even the background can help communicate information like the player's position. As we know, form fits function is a Classic game design tenet that structures the game while empowering the player. But it doesn't stop there. There's a personal element to Everyday Shooter that is important to Jonathan Mak, and Yesterday's Shooter, wouldn't quite be a repair of Everyday Shooter without addressing this area. The "video games as a storytelling medium" topic is weather and much worn by now. However, to take a simpler look at the situation, it's impossible to have action and real world forms without creating some sort of message. If I litter a game world with rubber swords that can't even injure a mouse, yet players can kill their enemies by typing in mean spirited words, the message is obvious: words are the real weapons that we all wield. Playing this game of "deadly words" would create a story out of function. 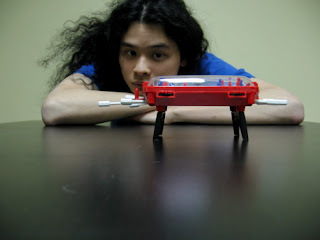 Jonathan Mak drew his inspiration for the themes, forms, and chaining systems in Everyday Shooter from many different sources. Porco in the Sky is a level inspired by the Studio Ghibli film Porco Rosso. By adding interesting interactions, interplay, and cleaning up the forms and functions in Everyday Shooter some of the ideas that sit at the core of Mak's inspiration can be communicated more clearly. The level with the centipedes already has me thinking about the intricate ecosystems in nature and how man can disrupt it all, even when man is as small as a dot. In other words, there's huge untapped potential for visual and functional/mechanical story telling. The sound design is a big part of Everyday Shooter. The sound scape is designed in part to be reactive instead of directly activated by the player's actions. The best example of this design is with the SHOOT mechanic. Unlike other games, in Everyday Shooter no sound effects are played for SHOOTing. Instead, a variety musical notes/sounds/riffs are played when shots hit enemy targets and when they are destroyed. In a way, this design feature, by taking away the direct results of the player's action, positions the focus of the game's interaction externally (outside the player). It's not about what the player can do to the world, but how the world responds. In this case, it's musically.This basic inversion of the traditional sound design sets the stage for the direction that Yesterday's Shooter continues to develop. When there isn't too much activity on screen in Everyday Shooter and the player isn't creating a cacophony of chained sound effects, the blend of layered sounds is quite nice. Many have described ES as a game where players can relax and gel with the music. Some have even gone as far as to say that playing through a level is like improving a private jam session in the style of each stage. As musically pleasing the sound scape in Everyday Shooter is, it doesn't do anything to affect the gameplay. It only colors the player's experience. In Yesterday's Shooter, the sound and music would be designed with an additional layer that feeds back into the gameplay. Two good examples are spatial tuning and riff releases. I'll explain. Spatial tuning is a mechanic that exists within the interaction with a single, specific enemy. When a shot hits this enemy, a specific musical note is played. By adjusting the player proximity relative to this enemy, the note value will go up or down in a scale. To destroy the enemy, players would have to find the distance that creates a tone of note that matches the background music or harmonizes with a musical riff that's currently being played. In this way, the player sets off the music, and the music in turn influences the player's actions. Also, such a mechanic dynamically redefines the space around the enemy while expanding the possibilities for interplay and unique interactions. Riff releases are attack bonuses for CHARGE attacks when the player releases a CHARGE shot to the timing of specific riffs or musical cues. Reacting to the music in this way allows the player to chain attacks in a way that isn't tied to the spatial, mechanic rules of the game world. 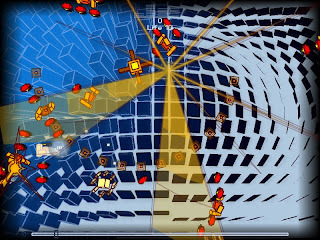 Mechanics like these are reminiscent of Electroplankton and other music-rhythm games. Another way to address the cluttered enemy issue is to add more players. With more players, the enemies can be divided and conquered. Additionally, with the new interplay and musical chaining systems players will have more ways to support and back each other up. In closing, Everyday Shooter is one of my favorite games on the PS3. I'd play it any day, or should I say everyday, over games like GTA4 and MGS4. It has charm, style, personality, and a lot of room to grow. The changes suggested in this repair are exactly the kinds of things I expect from a good sequel. Moving forward with our thinking and the way we design our games is key. The only way this is possible is by looking back on our past with a critical-eye. In the end, tomorrow is just as dependent on yesterday as everyday. Sorry don't know what happened there, feel free to delete the first post. I've wondered if the gameplay of Everyday Shooter is actually limited to the levels themselves or whether it exists beyond them. If you consider the levels and the persistent points scoring, and the ability to unlock extra lives, to all be part of the gameplay then Everyday Shooter is not simply about the three core mechanics but also about the gathering of resources, point and information, and using those resources to improve your chances on subsequent attempts at each level. In this case Everyday Shooter isn't about beating each level or gaining the most points in a single attempt, but is about the continuing attempt to gain more points, gain a greater understanding of the rules of chaining for each level. Looked at in this way it makes sense for the points to disappear rapidly, as this requires the player to make a decision as to whether to risk going for the points immediately so as to add to their resources, or to keep playing and thus make it to later levels which they can then learn the chaining rules for, adding to their resources in another manner. The changes and adjustments described would make playing each level of Yesterday’s Shooter potentially more engaging, but would work to greatly eliminate this second order form of gameplay. With any art form in this world(and anything concrete, abstract, or otherwise), there are always levels beyond the work itself. Humans have a knack for creating meaning in response to something and developing that idea ad infinitum. But I wouldn't say that the gameplay of Everyday Shooter is more about this second order experiences than what I detailed. The problem with your idea is that all games have these second order objectives, and when pursuing them isn't 100% necessary to win, they're just optional. And when they're optional, saying that they're a significant part of the gameplay is like saying getting all the coins/secrete block in Super Mario Brothers is a part of the gameplay. Assigning such a high value to unnecessary pursuits is a private matter between the game and the player. When in a game is the player not gaining more experience and knowledge about the game? These qualities you described are inherent to all games and human activities. Arbitrarily assigning value to optional elements in a game is part of the player's experience, but not really part of the game. Failing to collect all the coins in Mario has no bearing on the players ability to complete the level/game. Going out of one's way to teabag in Halo isn't really a part of Halo's design. It's something you can do, but the value assigned to successfully doing this is clearly outside the game. You made a case defending the way points are currently designed in Everyday Shooter. But if they were fixed as I suggested, the results you described would still be maintained. The player would sill be able to make decisions and calculate risks. In conclusion, the second order wouldn't be destroyed by my suggestions. Further more, the second order of play exists outside of the game and is arbitrary. It was an interesting thought, but it's best to stay as close as possible to what the game is. The unbending rules of a game are very important because every player must abide by these rules thus unifying and pinning down what the game is. Indeed all games feature some degree of second-order mechanics, however I think Everyday Shooter is potentially a special case. In Everyday Shooter this second order gameplay can feed directly back into the primary game mechanics through the ability to purchase additional lives with points accumulated over several play attempts. You are also able to unlock the individual levels and so learn them outside of the primary game. The latter method is a little more arbitrary but the former explicitly helps the player win. By accumulating points over several play attempts players can choose to spend those earned resources to make the primary game easier for themselves. This is inherently dissimilar to the two examples you described as in neither of us do the secondary activities serve to make the primary activity any easier. In this manner the game is not about playing each level in sequence until all your lives have been expended. It is instead about playing each level in sequence and using any points accumulated to purchase additional lives and make the game easier, or visual enhancements to potentially change the emotional and psychological impact of the game, or unlock individual levels so you can learn the individual chaining mechanics in isolation. In a very abstract way it’s a similar concept to the Total War games where actions in each gameplay mode cause changes in the other. Points are accumulated in one mode to be spent in another to cause changes to the initial mode. 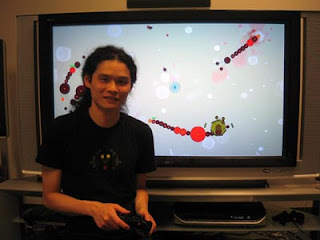 Jonathan Mak could just as easily have assigned the points to players automatically upon the destruction of specicif enemies, but he made them physical elements of the world. This is subjective but I feel he did that because the manual act of collection is important. If that is the case we should look at why. What are those points for? "The "video games as a storytelling medium" topic is weather and much worn by now. However, to take a simpler look at the situation, it's impossible to have action and real world forms without creating some sort of message. If I litter a game world with rubber swords that can't even injure a mouse, yet players can kill their enemies by typing in mean spirited words, the message is obvious: words are the real weapons that we all wield. Playing this game of "deadly words" would create a story out of function." I like how you immediately came up with a game that delivered a concrete message (unlike whatever message Braid was trying to tell). To me though, this idea of games delivering messages is pointless to good gameplay. "I like how you immediately came up with a game that delivered a concrete message (unlike whatever message Braid was trying to tell). To me though, this idea of games delivering messages is pointless to good gameplay." Instead of concrete I'd say clear or obvious. Braid's messages are more intangible, conceptual, and abstract making them harder to grasp and explain. But they're still good from what I remember. And instead of saying games that deliver messages as being pointless to gameplay, I'd say that story is orthagonal to gameplay. You'll sound smarter and cover up some of the harsh bias you may have. After all, the basic idea of visual/auditory feedback is messages that is delivered from gameplay interactions. Yeah, I agree with that. Anyways, what is Braid's message and what delivered it? Back when it was on the rage to guess it's meaning, everything was a theory and they were all over the place and the expanations to them sounded just as contrived. When Jon Blow himself says in a interview that no one has 100% "got" the message, that only tells me it was too abstract, convoluted and a failure on his part to deliver. I haven't played or studied Braid since I wrote my review so many years ago. I do remember that the gameplay concepts (playing with time and so forth) harmonized nicely with the emotional events of the poems/story. For example the idea of undoing a mistake was desired in the poem and this was contrasted with the ability to rewind time in the game. "Getting" works like Braid is probably an endless path. And thinking that there's just one interpretation isn't accurate. I assume that Blow mean that no one interpreted Braid as he does. If it bothers you so much, don't worry about it. I do remember how the rewind mechanic fitted in with the little books before each world. In the first (which is actually the second) world, one of the books basically says : shouldn't Tim be reward for learning from his mistakes rather than being punished for making them. To me, those were the only clear messages in the game. But I'm not convinced of much meaning outside of the books and how they related to the appropriate time gimmick. I'm always open to be shown otherwise if it helps me appreciate the game more. As for the moment, Braid comes off to me as a good puzzle game that's a bit overrated because of the exaggeration of it's "profoundness" and how it vindicates games as "art".